But if you expect the worst, you’re never quite as disappointed,” she said under her breath. That’s the gist of a conversation I had recently with an attendee of our Think Better, Live Better conference (I’m sharing this with her full permission). She literally started the conversation by telling me that expecting negative things to happen is her default way of coping with life’s challenges. If you can relate in any way at all, it’s time to revamp your mindset. Believing in negative thoughts and acting on them is the single greatest barrier to living a healthy, productive life. If you allow these thoughts to dwell for too long, they will succeed in robbing you of peace, joy, productivity, meaning, and ultimately your life. You will think yourself into endless disappointment, heartache, and even bouts of depression. And make no misunderstanding about it, when you are feeling down on a consistent basis, the battle you are going through isn’t fueled by the words or actions of others, and it isn’t fueled by what did or didn’t happen in the past either. It’s fueled entirely by your mind that gives negativity a voice. In a very real sense, you are what you think—you can’t change anything if you can’t change your thinking. But, are you ready for the silver lining? And when you change the way you think, you can gradually master a new way to be. People who are habitual negative thinkers are often proud to describe themselves as “realists.” Of course, anyone who holds a strong belief thinks they are being “realistic” by holding it, whether it involves alien encounters, perfectly truthful politicians, or otherwise. The “being realistic” pronouncement is a favorite among cynics everywhere. And in a way they are correct. But only because negative thinking causes the human mind to give up on everything—to not even try, or to give a disorganized, half-hearted effort—so the negativity itself influences the end result. Self-fulfilling predictions like this really do happen. Research even suggests that in some cases what we believe about our health can have more bearing on how long we live than our actual physical health. So, why do we as human beings do this to ourselves? What makes all of this so alarming is the fact that it means negative thoughts can plague us even when life is going relatively well. For instance, the thought “This is much too good to last!” quickly wreaks havoc on a positive situation. Thus, the methods discussed below have to do with how negative thinking distorts our perception. 1. Watch your tendency to over-generalize the negative (and minimize the positive). For example, if someone rejects you or turns you down for a date, do you spread the negativity beyond that person, time and place by telling yourself, “I’m just not good at relationships; they never work out for me, ever”? If you fail an exam do you say to yourself, “Well, I failed that exam; I’m not happy about it, but I’ll study more next time”? Or do you over-generalize it by telling yourself you’re “not smart enough” or “incapable of learning”? Remember, negative thinking stops us from seeing and experiencing positive outcomes, even when they happen often. It’s as if there’s a special mental block filtering out all the positives and only letting in data that confirms the negative biases we have. So, do your very best to catch yourself today. 2. Start focusing on the grey area between life’s extremes. Since 99.9% of all situations in life are less than perfect, “all or nothing” thinking tends to make us focus on the negatives—the drama, the failures, and the worst-case scenarios. Sure, catastrophes occur on occasion, but contrary to what you may see on the evening news, most of life occurs in a grey area between the extremes of bliss and total devastation. Our negativity leads us to quickly jump to negative conclusions about the unknown, which can be especially harmful in our relationships. We are provoked to interpret something another person does as being negative, even when we have been given absolutely no indication of what the other person is thinking. For instance, “He hasn’t called, so he must not want to talk to me,” or, “She only said that to be nice, but she doesn’t really mean it.” When we jump to conclusions like this, we only cause ourselves and others unnecessary pain, stress and frustration. So, if someone says one thing, don’t assume they mean something else. If they say nothing at all, don’t assume their silence has a concealed, negative connotation. Assigning meaning to a situation before you have the whole story makes you more likely to believe that the uncertainty you feel (based on lack of knowing) is a negative sign. 4. Identify the underlying triggers to your negative thinking. At the very least, this process of evaluating your negative thoughts and their underlying triggers helps bring a healthy, objective awareness to the sources of your negativity or anxiety, which ultimately allows you to shift your mindset and take the next positive step forward. All journeys of positive change begin with a goal and the determination needed to achieve it. However, what do you think happens when you are too determined, or too obsessed, with a goal? You begin to nurture another belief: who you are right now is not good enough. In a nutshell, her over-the-top efforts to meditate for extensive periods of time had opened the doors to lots of unexpected self-criticism and stress. Thankfully, with a little coaching from Angel and me, she eventually realized her obsession toward meditation had made her forget one of the basic objectives of meditation—self-acceptance. So, the bottom line is this: you have to accept yourself as you are, and then commit to personal growth. If you think you are absolutely “perfect” already, you will not make any positive efforts to grow. But, constantly criticizing yourself is just as counterproductive as doing nothing, because you will never be able to build new positive changes into your life when you’re obsessively focused on your flaws. The key is to remind yourself that you already are good enough; you just need more practice. Change your mantra from, “I have to be better,” to, “I will do my absolute best today.” The second mantra is far more effective, because it actually prompts you to take positive action at any given moment while simultaneously accepting the reality that every effort may not be perfect. Being able to distinguish between healthy striving and self-abuse on your journey is another critically important step towards living a happier and more successful life. That’s such a strong way to live! It’s about using your faith to fuel positive thinking and positive action, every single day. I sincerely strive for this in my own life. And, I sincerely wish this for YOU. It’s important to note, too, that replacing your negativity with positivity isn’t about turning off all your negative thoughts—that’s nearly impossible because negative thoughts typically arise spontaneously and uncontrollably. It’s also not about turning your false negative thoughts into false positive ones. The goal is to reframe negative thoughts effectively, so they are based entirely in reality, detached from needless drama, and focused on the next positive step forward that can be taken in the present moment. The five methods covered above provide solid starting points. Challenge yourself to START, today! And, with “starting” in mind, I’d love to hear your thoughts about this article. What resonated with you? Where will you start? Is there anything else you would add to the list? 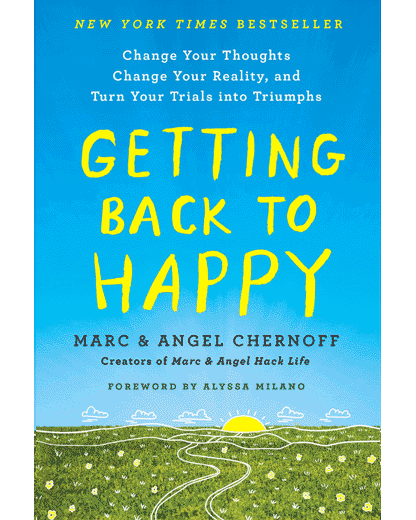 Marc & Angel, I’m truly enjoying the teachings in your course and here on your blog. And this speaks volumes about your work, because when it comes to self-improvement, I honestly used to be one of the cynics you mentioned. But I’ve truly grown to appreciate your insights, which is why I’m a student in your course, and why I’m writing this now. Thank you. As it relates to your question about where I will start, #5 is one of my greatest struggles lately. I’ve made lots of progress, but I often come down hard on myself for not being further along…better…stronger, etc. Thank you for the much-needed reminder to change my mantra and the way I speak to myself. I am starting now. Mellissa, you’ve progressed amazingly over the past couple months. It was great with speak to you recently on the coaching call and hear how things have been going at your end. Angel and I are honestly so proud of you. Thank you for checking in with us here, too. Thank you as always, M and A. I continue to love how your insightful guidance for life arrives in my email inbox right when I need it. I really connect with the idea of not looking for negative signs from other people. The more I think about it, the more I realize how often I do this in my relationships. I certainly let the uncertainty of a situation paint a dark picture in my mind. I’m going to do my best to start catching myself. Cheers! PS: Congratulations on the new book. I just ordered it and I’m looking forward to another good read from you two. THANK YOU SO MUCH for writing and sharing this post publically. It makes so much sense to me. I’m currently struggling with lots of anxiety and a broken heart following a long, brutal divorce My negative thinking gets the best of me more than I’d ever like to admit. I know I’m better off now, but I can’t seem to get past certain trains of thought. I’m going to start with #1 and then #4 — I see plenty of room for improvement in those areas. Also, I pre-ordered you book just now, too. My way of saying thanks for everything. Great article! Timely for me. So Very True!!! Just pre-ordered your new book!!! That simple message helped me focus on possibilities and not on potential negatives. These 400 messages are in my book “Above The Chatter, Our Words Matter” and the five of these words have changed my outlook and my live dramatically. Love it! Thank you for sharing this, Bruce. Really interesting reading. What if a person who says they are a realist is a person who has experienced psychic phenomenon and has seen things before they happen? Yes, I know…you probably weren’t expecting this kind of comment. Is that negative thinking.. I’d be interested in knowing if there are any studies out there that correlate those two. And yes, I realize this is not the point of the article. An interesting question, but to be quite honest, we’re not in a position to comment on the effects of a “psychic phenomenon.” This is not our area of expertise. More studying would have done first. Sorry about that. Marc, I have been reading the articles and emails you and Angel write for a while and must say it’s truly awesome. They are very educating and encouraging. You both have inspired an 82 hero old, lost soul. Thanks so much! Superb! Beautiful! Mantras for all those who are waiting on the way of life with a wish to be changed. We are maneuvered by the thoughts we cultivated in our minds. We should be able to watch our thoughts. We are what the thoughts we have in. Marc and Angel, thanks for sharing this – it’s absolutely brilliant! From my own experience I can tell how important is to look after our mindset. It’s key to drive us to a bliss life path. I take xanax regularly because of the stress I create for myself. I always find myself thinking about “what could go wrong” vs “what could go right”. I am certain this is slowly killing me. I need a reset. Maybe a vacation. Thank you for your truthful blog. I will keep reading and try to improve to control this viscous killer, self doubt. You said the stress I am creating myself, sometimes we here a small sentence from someone that hits home. This little remark you made certainly did. For me.. thanks for that I do it all the time create stress where there should not be. I am not a negative thinker. I am just so hard on myself. I am verbally abusive and don’t accept mistakes I make. If it were someone else doing this to themselves, I would be coaching them that no one is perfect and to give themselves a break. I don’t understand why I expect so much from myself and get so upset and downright mean when I make a mistake. Rationally I can see this is wrong and unhealthy but it doesn’t stop me. I have positive affirmations at my desk, in my purse and around the house, but those ring hollow. Not sure where to go from here. Absolutely love this! The new movie “I Feel Feel Pretty” has a great message about ‘Acting As If’ and how it changes your life! I also wrote an article here about the “Mean Girl” that lives inside most women’s brains, constantly belittling her, which I hope you don’t mind my sharing since I think readers will recognize this voice. Your blog has been so amazing in my world. Thank you! I’ve been struggling recently with my negative thinking, especially related to a situation where I know the outcome that I want, but it is going to take time to get there and I have no idea how it will turn out… and also with thoughts around my new job which is turning out to be more challenging (and stressful) than I imagined it would. I’m going to work on all 5 suggestions with a strong emphasis on #3 and #4. Thank you, as ever. Your clear writing and positivity provide important action steps for all of us! I for one need it and appreciate you both. Great advice. I also *HIGHLY* recommend the book, The Happiness Trap by Russ Harris. It upended my relationship with my thoughts, in a good way – especially with frequent negative thoughts – and has brilliant, unexpected tools to help knock them out of their loops. Changing your mindset from negative to positive is the first step to having a happier life. all I can say is thank you, have been struggling with this thought for only God knows how long. Thank you so much on teaching me on compartamentalizing negative situations that may happen in your life. I have recently failed the bar exams resulting to a loss of a belief system that is causing me disillusionment and doubts in God. I have 2 issues to resolve in order to get back on my review and try again. Firstly, to find out where I went wrong doing my studies. I found out from you that there is a difference betweem self abuse leading to become obsessed with passing and mere striving. Here, i realized that I over studied to the point that quantity superceded quality. Second, as a child, my parents or teachers would just tell you to try your best and God would do the rest. I guess St Ignatius of Loyola just had to place things in a different perspective to hit the mark. Yes, I shall adopt his mantra. Thank you. After reading this, it gave me a lift. I’ve been lost in negative thoughts for time now. Time to fill my life with more positivity.